In a bizarre, highly deplorable judgment delivered on Tuesday, Suryakant Shinde, Sessions Judge at Gadchiroli District Court in Maharashtra convicted Prof GN Saibaba (Delhi University), Prashant Rahi (Journalist from Uttarakhand), Hem Mishra (Cultural Activist, Student, Jawaharlal Nehru University, Delhi), Mahesh Tirke, Pandu Narote and Vijay Tirke (tribals from Gadchiroli) and sentenced life imprisonment to the first five and ten years imprisonment to the last, under Sections 13,18,20,38 and 39 of the Unlawful Activities Prevention Act and Section 120-B of the Indian Penal Code. The judgment is illegal, irrational, atrocious and highly motivated, to say the least. None of the charges framed against the accused stand a real test of judicial inquiry as all of them are fabricated and the evidences are concocted or drawn out of context. Even in case law, there are several instances where the other courts including Supreme Court struck down this kind of irrational charges and acquitted all the accused. However, the judge in his wisdom chose to believe whatever the prosecution cooked up and sentenced the highest possible punishment. The 827-page voluminous judgment ridiculously cites so many irrelevant and unconnected issues the prosecution has dished as evidence, including some request notes and leave letters written by Saibaba to the authorities of a Delhi college where his daughter was studying and routine letters written by his wife to her bank regarding double entries. The major charge of the prosecution is that the accused in this case were waging war against the country and supporting the ideology of a banned organization, CPI (Maoist). Anybody can easily understand that to ʹwage a war" somebody needs weapons and none of the six accused were shown as possessing any weapon on them when arrested or the police did not find any in searching their houses. Supporting an ideology, even if the same ideology is adhered to by a banned organization, cannot be a crime. In fact, the highest court of the land, Supreme Court, categorically said in a famous verdict that even the membership in a banned organization cannot be a cause for conviction, until and unless the accused is proven beyond doubt to be associated with a Crime. The developments leading to the foisting of the case have to be recalled here. 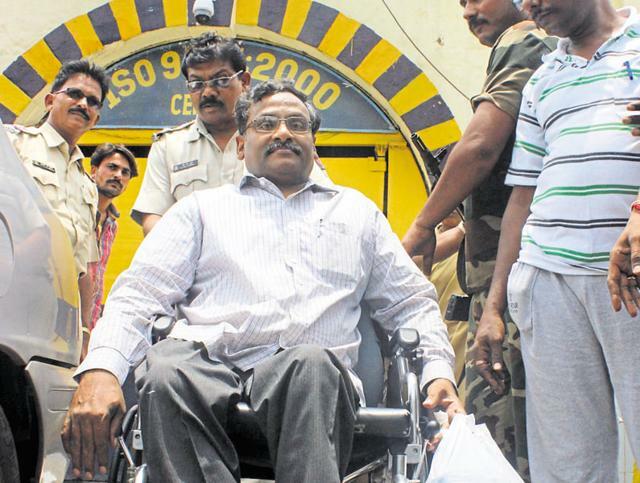 There was a raid in 2013 on Saibabaʹs official quarters on Delhi University campus (at that time he was living in Gwyer Hall, the chief wardens residence allotted to by DU authorities Saibaba since he was 90% disabled) and his computer and some books and papers were stolen by Maharashtra police. There were no witnesses, nothing was sealed before him and almost one year later he was arrested on a fictitious charge. Much later the prosecution, in its chargesheet, cooked up many incriminating documents and claimed that they were collected from his hard disk. Saibaba is a wheel-chair bound physically disable person and in medical terminology he is known as a person with 90 per cent physical disability. He needs assistance in all his daily activities. But when he was in detention, he was dragged, pulled, pushed, bundled into unhygienic police vans that travelled hundreds of kilometers on rough roads, all that resulting in deterioration of his health, not to mention the mental stress it caused. Because of this harassment his ligaments were severed, nerves bruised, his heart problem aggravated and his left arm and hand were completely paralyzed. Similar were the sufferings of Prashant Rahi and Hem Mishra. Then all of them were, along with three tribal youth from Gadchiroli district were implicated in the false and fabricated case. Their bail applications were consistently rejected against medical advices and after a huge national and international protest. All this physical and mental torture including the false case and bail rejection was to silence the voice of protest against Operation Green Hunt, a war on people launched by the Union government and the state governments in and around Dandakaranya against all those who oppose the selling out of rich mineral resources in Central India to MNCs and their compradors. Prof Saibaba was very active in the peopleʹs movement against Operation Green Hunt and brought out the atrocities being committed by state forces, before people at large. Thus the state had developed a grouse against him and his associates and the then Home Minister Chidambaram named him openly and began the targeted repression. The NDA government continued the same. Thus the present judgment is a culmination of that vicious campaign against him and all those who opposed the outright sell-out of Indian mineral resources to MNCs and their compradors. The repression is because of their steadfast support to Adivasis of Central India, who are waging a valiant fight to protect their resources. The judgment is a part of the grand design and machination of the state which is hell bent to conduct an all out onslaught, including air raids and carpet bombing on the fighting Adivasis and harassment through raids, arrests, cases and deplorable sentences against those who speak in favor of Adivasis. The state wants to grab the peopleʹs resources and silence those who question it. We are sure, the judgment will not stand the scrutiny of any right-thinking person and we hope it will be struck down by higher courts as we are going to challenge it. But, in the meanwhile, we appeal to all democrats and citizens who respect rule of law and fair trial to oppose this judgment, as it is against rule of law and most disturbing instance of unfair trial. We appeal to people at large to register their protest in all forms so that the public pressure will lead to striking down the impugned judgment.